Repurpose an odd piece from an old tea set and make a useful little sewing kit for a guest room or your own use. 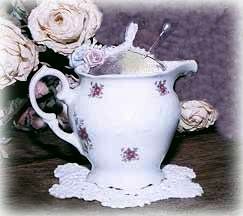 – tea cup, creamer, sugar dish, teapot,etc. Wonderful little sewing kits for guest bedrooms, etc. Any piece from a tea service can be recycled for use in this project. For my lid, I use a 3 inch styrofoam ball and cut it in half. You’ll need to test your foam ball for fit, by pushing it into the opening of your piece to make sure that you have a secure fit. You don’t want your pin cushion dropping down into the container. Once you have your foam cut to size, cover it with a piece of fabric, by wrapping your fabric over the ball and securing with glue on the flat side of the foam. Attach a piece of ribbon from one side (at the underside of the ball) to the other side, bringing up a small piece of the ribbon to act as a handle for removing the lid. You’ll have a nice little mess on the flat side of your ball now. Simply glue a piece of fabric or cardboard to cover where all of the fabric and ribbon ends meet. For a perfect fit, place your lid on top of fabric and draw around the perimeter of the lid. Cut your piece of fabric just inside of the line you marked and attach with hot glue. Glue a few silk roses or other embellishments of choice, fill your piece with a few spools of thread, a couple of needles, pins, etc. and you have a wonderful little sewing kit. Don’t be afraid to give your lid a little push to fit snuggly. The foam will press a little for a nice snug fit. Be careful not to push too hard though, or you may end up with a lid that’s just too small.